Photographer Alfred Stanley Johnson, Jr. specialized in the tall-tale postcard, extolling Wisconsin's agricultural abundance through images of oversized produce and animals. 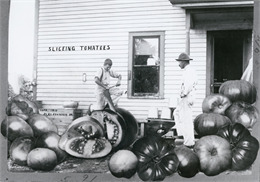 Staging his friends and family to pantomime story lines, Johnson added enlarged fruits, vegetables and animals to fit the background and included titles that attributed bountiful crops to local communities. Johnson's tall-tale postcards affirmed the American myth of abundance — a myth often at odds with reality. 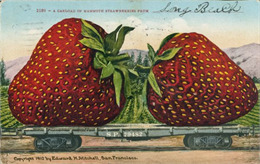 Tall-tale postcards emerged around the turn of the 20th century, when postcards came to function as surrogates for travel. 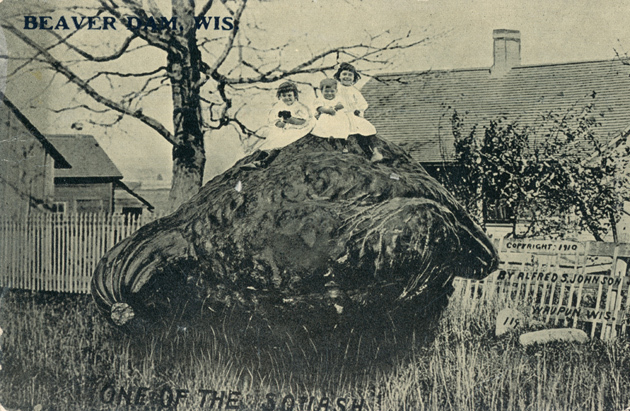 People soon realized that postcards could be used to create or sustain a certain utopian myth about a town or region, and crafty photographers began to physically manipulate their photographs. 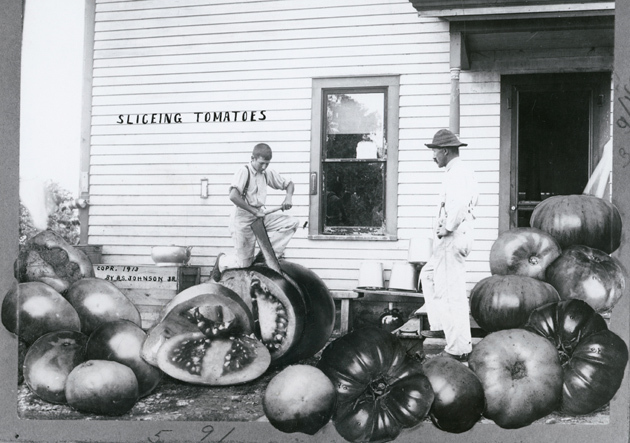 Nowhere did these modified images, or "tall-tale postcards" as they came to be called, become more prevalent than in rural communities that hoped to forge an identity as places of agricultural abundance to encourage settlement and growth. Food sources specific to the region — vegetables, fruits, or fish — were the most common subjects. 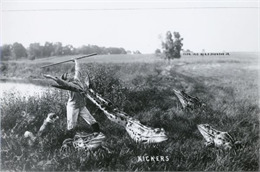 Alfred Stanley Johnson, Jr. began making tall-tale photographs around 1908 in his Waupun studio and worked for more than a decade to develop and fine-tune the genre. 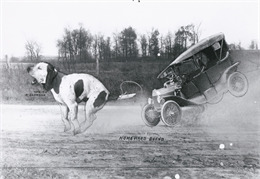 By the late 1890s, automobiles had revolutionized the United States Postal Service, making it an increasingly efficient means of long-distance information exchange. The USPS's rural free delivery (RFD) program, which provided free service to America's rural areas, officially debuted in 1902, closely coinciding with the release of the first Kodak Brownie camera. These technological factors precipitated the decade-long Golden Age of Postcards in America, lasting roughly from 1905-1915. As with any new medium of information exchange, however, it took a while to realize the full potential of postcards as a long-distance carrier of condensed visual and textual statements. 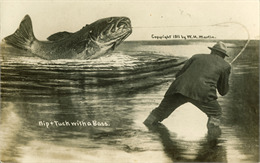 Not until 1907 were "divided back" postcards widely-accepted in America, which allotted for both a written message and a recipient's address on one-side, leaving the flip side open for an image. Since postcards eventually came to function as a surrogate for travel, the photographic images depicting a geographic location engendered a certain myth about that town or region, usually equating the land with an Arcadian utopia. The most crafty photographers soon realized that this myth could be altered not only by manipulating the camera's gaze, but by physically manipulating the photographs themselves, exploiting their ostensibly naïve depictions. 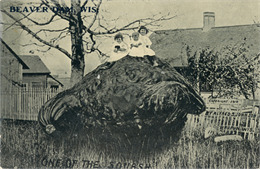 The basic process for creating a tall-tale, or "freak," postcard is simple: a photographer would take two prints, one a background landscape and another a close-up of an object, carefully cut out the second and superimpose it onto the first, and re-shoot the combination to create a final composition. The most common subjects were food resources specific to the region — vegetables, fruits, or fish. 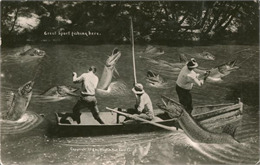 Successful tall-tale postcard artists were those not only skilled enough to seamlessly join together two images, but also those able to envision and create dynamic compositions, often involving people mid-action. Though difficult to perfect, the resultant product was compelling, evoking a documentary snapshot. The first master of tall-tall photography was William H. "Dad" Martin (1865-1940). 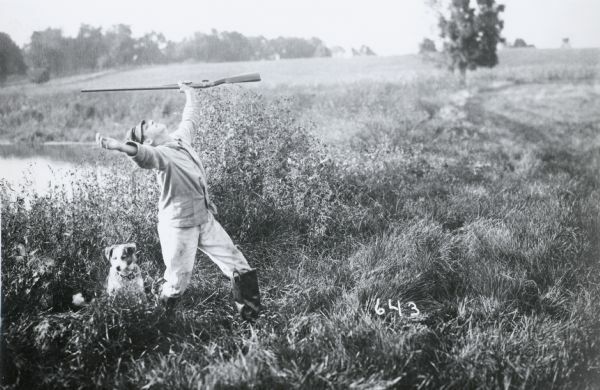 At the age of 21, Martin moved to Ottawa, Kansas to learn photography from E.H. Corwin, whose studio Martin eventually purchased a mere eight years later. In 1908, he began crafting tall-tale post cards. His exaggerated images quickly became so popular that, within one a year, Martin's company was allegedly turning out over 10,000 postcards per day. His impressive, dynamic compositions set the standard for the genre. Where Martin defined the genre, Alfred Stanley Johnson, Jr. (1863-1932) stretched its manifold possibilities and allowed it to flourish as a true art. 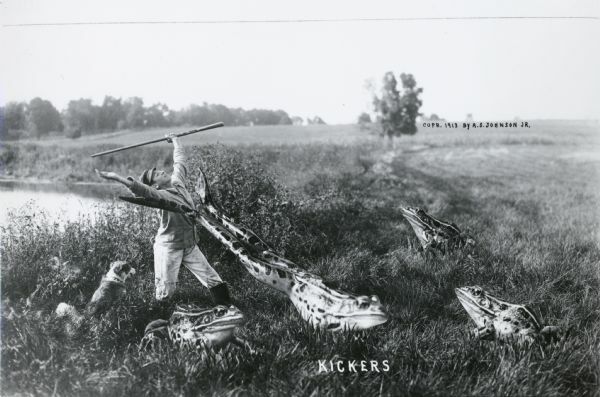 Johnson, the son of an English photographer from whom he learned the trade, began making tall-tale photographs around 1908 from his studio in Waupun, WI. Since so little biographical information is known about either photographer, it is difficult to say with certainty whether they were familiar with each other's work. By comparing certain compositions, such as Martin's "Bringing in the Sheaves" (1908) and Johnson's subsequent "Our Barn is Full" (1912), it is reasonable to argue that Johnson used Martin's earlier photos for inspiration. Whereas Martin seemed to be drawn to the format for its financial prospects, and left soon after realizing them, Johnson worked for over a decade to develop the medium. By examining a sample of these works, a clear progression in sophistication emerges, with regards to both content and composition. Even through a cursory comparison of "Onions" (1909) and the much later "Homeward Bound" (1915), shows a drastic evolution in style. 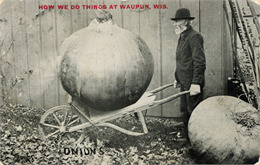 In the former, the onion rests motionless on the farmer's wheelbarrow with an almost statuesque, albeit elegant, rigidity. By comparison, the later image, one of Johnson's most adventurous, is full of animation and vitality. 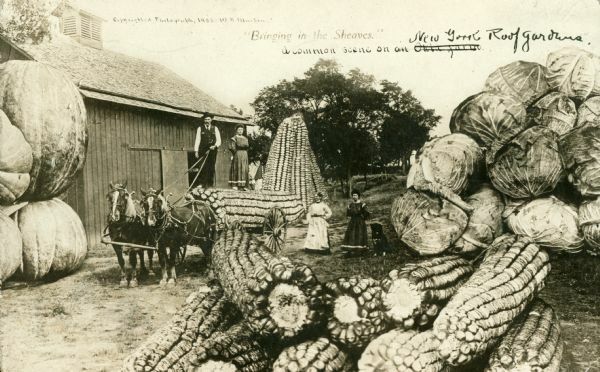 Tall-tale postcards affirmed the fundamental American myth of agricultural abundance — a myth that often diametrically opposed reality. Ultimately, these deceptions remain benign by way of their sheer absurdity, injecting a light-hearted, often humorous note into a landscape seldom willing to offer its own. If the ideal promised by the American Frontier did not yet exist in the real landscape, at least it might in an imagined one. In 1915, due to the onslaught of World War I, America banned the import of German postcards, with their diminished popularity on a national scale to follow soon after. Arguably, the aftermath of the war also fractured, for the first time, the very utopian myth upon which these postcards were based. What's more, the advances in technology and production catalyzed by wartime industry, in the form of and affordable personal automobiles and telephones, ushered in new systems of information exchange, making postcards all but obsolete. Still, some of the allure once held by postcards remains even today as a mode of communication laden with nostalgia, found — unsurprisingly — mostly in rural vicinities. This kitschy legacy of earlier tall-tale postcards — the mutated grandchildren of the images in this gallery — is, perhaps, one of the most palpable ways in which the wounded, dwindling myth of an American rural utopia still persists.